Seeing those kids wearing the body of an animal like some sort of suit calls to mind the ghoulish sartorial preferences of Ed Gein or Leatherface from The Texas Chainsaw Massacre. Once your kids become acclimated to wearing StretchKins, they will soon find themselves dissatisfied with a mere stuffed animal and will demand to put on the real thing, which will do much to get fresh road kill off the streets. One wonders just how much time those poor StretchKins animals had to spend on the rack to give them such freakishly long arms and legs. 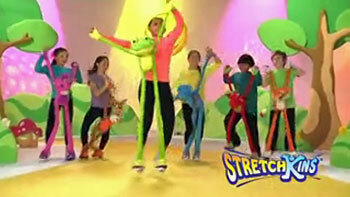 Most of the StretchKins infomercial looks like a really cheap version of those old Sid and Marty Krofft Saturday morning shows from the 1970s. Even if they don’t convince your kids to exercise, StretchKins will be an invaluable aid to any parent who wants to introduce their children to the furry lifestyle. Are we so desperate to find decent toys for our children and there are NONE to be found that we buy this CRAP?! Okay. All the things you said is 100% not true. You see that girl that’s always in the yellow shirt and always doing gymnastics ballet and cheer leading? Yeah that girl is me. If criticize this one more time ill call the company and tell them to sue you. If you don’t change it. Yeah, Paul, take this post down. You’re not allowed to criticize things on the internet because that’s like illegal and stuff! I’m willing to ignore the weirdness of the product…because the person singing the jingle on this ad is slightly off-beat and it’s distracting. The jingle itself isn’t even catchy. sue him? the point of this website is to MAKE FUN of weird commercials, unless your too lazy to read any description. 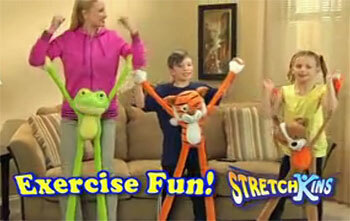 “Infomercial Hell has fun with some of the most laughable infomercials ever broadcast. This site does not review products and neither endorses nor condemns any of the products sold on the infomercials.” so what you dont like his review? ITS AN OPINION! cant sue someone for that. plus people on youtube say things 10 times as hurtful things. Wow! I actually love it… I can’t get the stupid song out of my head. Very funny idea. Oh, man. These are totally ripped from a toy I had back in the early 90s. It was a really creepy doll with springy limbs that you’d attach to your feet and hands, then she’d “dance” with you. It was creepy then, it’s creepy now. I imagine Paul is an affiliate. I mean, who has time to sit around, take pics of commercials, pull and post videos, etc. without a job? Paul, tell us, do you just milk a huge affiliate payout from one of your other sites, this one or off of links from this one to affiliates? Come on, come clean. BTW, Stretchkins is a neat item. You are unecessarily being a jerk here. Omg they Are the creepiest things I have ever seen. Hysterical to think someone actually paid for that ad!! Threatened by jokes much, TV Guy? Jeez, TV Guy. Sounds like you’re some kind of slow witted moron and just can’t fathom how a reasonably intelligent person can hold down a real job, watch a two to three minute commercials in their off time, take three screen grabs and write a few paragraphs on why (s)he thought it was funny. Even if you’re a moron, that takes two hours – tops. And this commercial and product blows hard. The only ones being jerky are you and that supposed kid who tried to rule the internet. Kyla, you rule! I have been watching this post because I am so insulted by these kind of commercials and products. I’m sure no one has ordered these stupid items. Maybe the genius makers thought if we make the product soooo dumb and the commercial an insult to intelligent people with money to buy it…it would become a joke and people would buy it as a joke for white elephant parties or gag gifts. But that’s been done before and we’re all wiser to that game. Very Cool! You can dance, play and have fun with these amazing new Stuffed Animal puppets. I never saw such a useful toy item! Just the creepiest things. Disturbing, really. I cannot wait to purchase this product for my 4 year old daughter. We went over to have a playdate with my friend’s daughter and they were taking turns playing with it. What a brilliant idea. This would be a great idea for a themed birthday party. I tell them no, they break easily and are too expensive. You would just cry, I tell them. Bought one for each grandson. Seam ripped on first stretch on both of them.